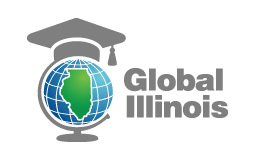 The Illinois Global Scholar Capstone Assessment requires students to investigate a global issue or concern connected/related to one or more academic disciplines. To do this, the student must first develop a compelling and actionable question that addresses a global issue or concern. A student will then research/investigate the question, draw conclusions, and develop a solution that is supported by research. Finally, the student will communicate with and receive feedback about his or her solution from a stakeholder who has firsthand knowledge and experience with the global issue or concern and use this feedback to take action to affect positive change. 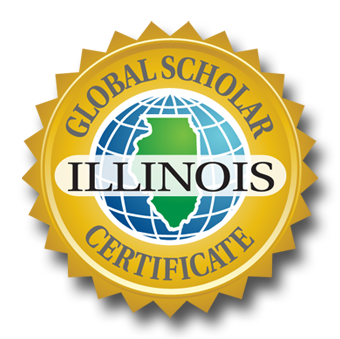 In order to earn the Illinois Global Scholar Certificate, students must earn a score of “pass” on the Global Scholar Capstone Performance-based Assessment using the scoring criteria defined by the Illinois State Board. The purpose of the capstone assessment is to ensure the high level of knowledge and skills possessed by the students completing the Illinois Global Scholar Certificate. Students will engage in a process of inquiry with required components and products, demonstrating mastery of designated standards. The standards addressed by this assessment incorporate both national learning standards and established standards for global competence. Develop compelling questions and plan inquiries. Communicate ideas effectively with diverse audiences. Translate their ideas and findings into appropriate actions to improve conditions. Engage in appropriate and informed actions to address or potentially improve conditions based on analysis of a global issue/concern. Students completing the capstone performance-based assessment will progress through seven steps: (1) develop a compelling question, (2) investigate and research (3) draw conclusions and propose solutions to two “on the ground experts” (4) create an artifact, (5) communicate, (6) take action to affect change, and (7) reflect. Students will complete two products: (1) a written narrative describing the entire experience and (2) documentation that presents the artifact and provides proof that steps 1-7 were adequately completed. The student can divide the narrative using subheadings that correspond to each of the seven required steps, but the narrative document should be submitted as a complete document. Because the documentation folder will likely include a variety of media, it should be submitted on a flash drive or google folder. School districts will utilize specific criteria and indicators s to score the Global Scholar Capstone Performance-based Assessment. These scoring criteria may be amended from time to time. A current list of these indicators is available at the Illinois State Board.